Another gorgeous day overlooking the Monterey Bay and another gorgeous Bride! She was slim and lovely with a perfect figure… I was afraid nobody would even notice the wedding flowers I designed for her!!! Oh well, she noticed them and she loved them, that’s all that matters. One of the rare brides that DIDN’T ask for peonies so she was really happy with those big full fragrant blooms! The size of a baseballs, with a border of her favorite, anemonies with black centers… or so she thought, it wasn’t until after the ceremony I showed her that I had hand painted all the centers of all the anemones! Poor Luke who works with me, I thought he’d get cross eyed hand painting flower centers, but there were only white on white available, the black centerd ones had ended their season just a few weeks before, but it was worth it and she loved them and laughed at the thought of us with our little brushes painting her anemones one by one! She had another surprise waiting for her at the reception, she had wanted blossoms, but knew it was way past blossom season, I told her not to worry. 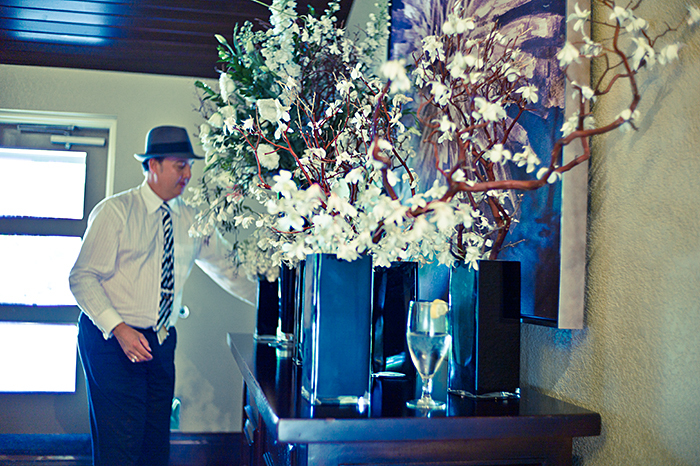 When she walked into the ballroom, each center piece was a tall black vase to match her black and white theme, and in them were three foot tall manzinita branches with hundreds of white blooms! Hand glued Dendrobium orchids from Hawaii glued one at a time, it looked just like blossoms, and with the little hanging tea lights in each branch they just glowed! Ok, now I’m tired just thinking about all the work that went into that wedding, but what really sweet people, it was a pleasure! I have to start planning this weekends wedding, all living plants, orchids etc, for the center pieces and a brides bouquet made up of succulents, and a grooms boutonniere to match, that way they can plant them after the wedding and keep them forever!